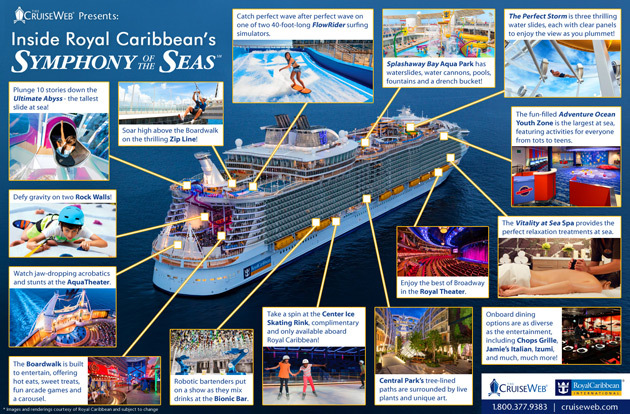 Preview Royal Caribbean’s next adventure-packed, fun-filled ship, Symphony of the Seas, with The Cruise Web’s latest ship infographic! Royal Caribbean is known for bringing the ‘WOW’ factor aboard its ships, and the Symphony of the Seas will not disappoint. She’s built to deliver the thrills with a twisting ten-story slide, two rock walls, a pair of FlowRider surfing simulators and a zip line! Plus, guests will discover non-stop entertainment and dining options including sweet Boardwalk treats, Jamie’s Italian and the bustling bots of the Bionic Bar. Symphony of the Seas launches in Europe next spring, and then repositions to the Caribbean during the fall of 2018. Symphony of the Seas debuts in the Mediterranean in April 2018 where she’ll sail all summer out of both Barcelona and Rome. In October of 2018, she will reposition to the Caribbean for a season of Eastern Caribbean and Western Caribbean sailings out of Miami, Florida. 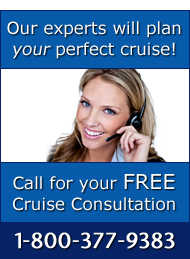 To learn more about Royal Caribbean’s next ship, Symphony of the Seas, contact The Cruise Web’s expert consultants today at 1-800-377-9383.